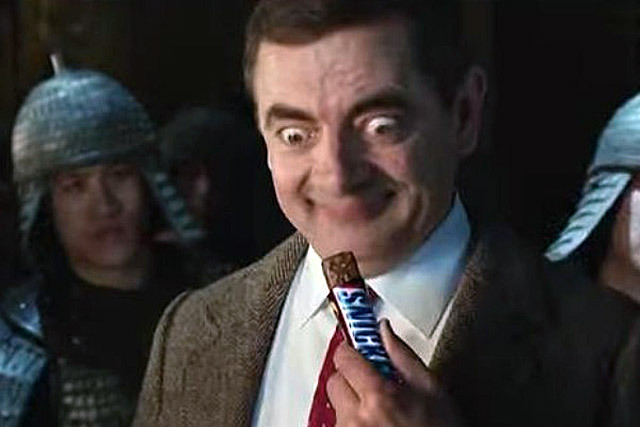 Mars has signed comedy character Mr Bean as the face of its latest "you're not you when you're hungry" ad for Snickers. The chocolate brand has rolled out a 60-second TV ad by AMV BBDO featuring the character playing the role of a "Kung Fu master", who is unable to "remember his training" until he’s had a Snickers. It is the first TV ad actor Rowan Atkinson has appeared in since the 1990s. Produced in the style of a martial arts epic and set in ancient China with actors speaking Mandarin, the ad features Mr Bean clumsily walking over roof tops, as his comrades glide over the city in silence. He then falls into the hands of the enemy, before eating a Snickers to recover his skills. The ad first aired during 'The X Factor' on Saturday. As part of the launch, there are four Mr Bean Kung Fu training sketches available through social channels and a takeover of 'The X Factor' app. A 60-second spot will also be shown in cinemas across the UK in the run up to Christmas. Michael Magee, vice-president marketing at Mars Chocolate UK, said: "We are very proud of the creative work that has gone into bringing Mr Bean back to the small screen in this new 'you’re not you when you’re hungry'. "Mr Bean is such an iconic and internationally recognisable character, who fits so well with the Snickers brand, giving this ad great global potential." This latest ad builds on the 'locker room' Snickers spot, which launched in 2012, featuring Joan Collins and Stephanie Beacham. Before that the brand, featured Mr T as the face of Snickers.